Jerky's Gourmet is a new brand of jerky, founded by Tim Gerstman and Andria Taylor, based out of San Diego, CA. Gerstman, who transplated to San Diego from the East Coast 8 years ago, met Andria who also happened to love beef jerky. The two joined forces and launched Jerky's Gourmet. 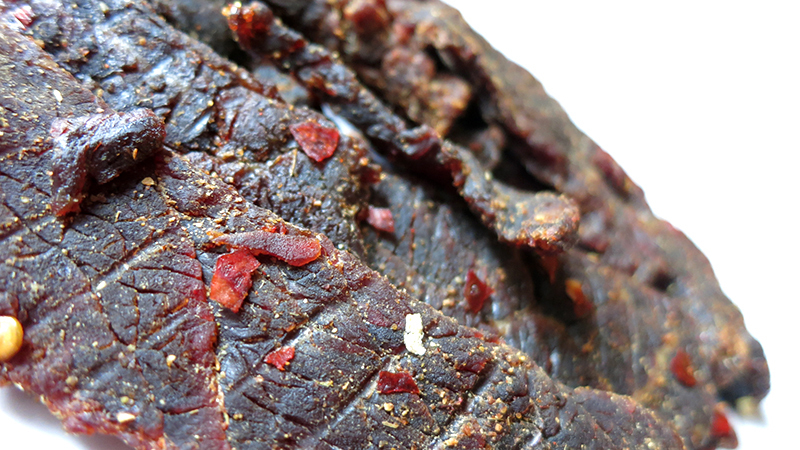 Their jerky is sold at various shops, bars, and venues across the San Diego area. 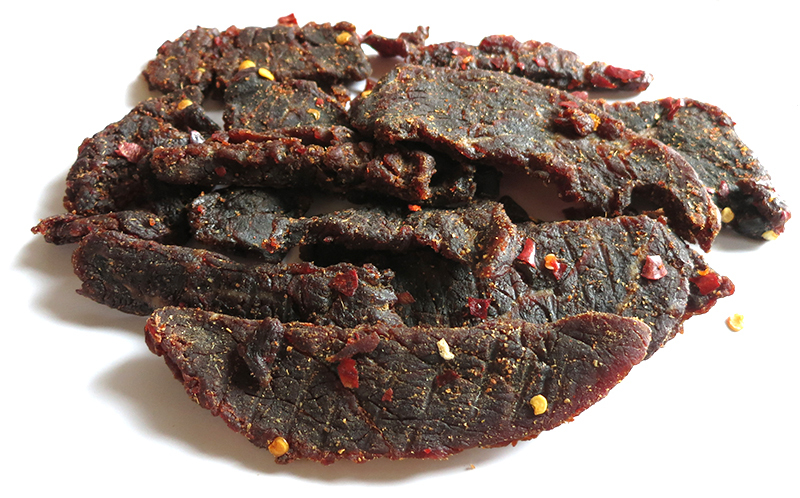 However the two can be found at the Little Italy Farmers Market on Saturdays, doling out samples of their jerky. 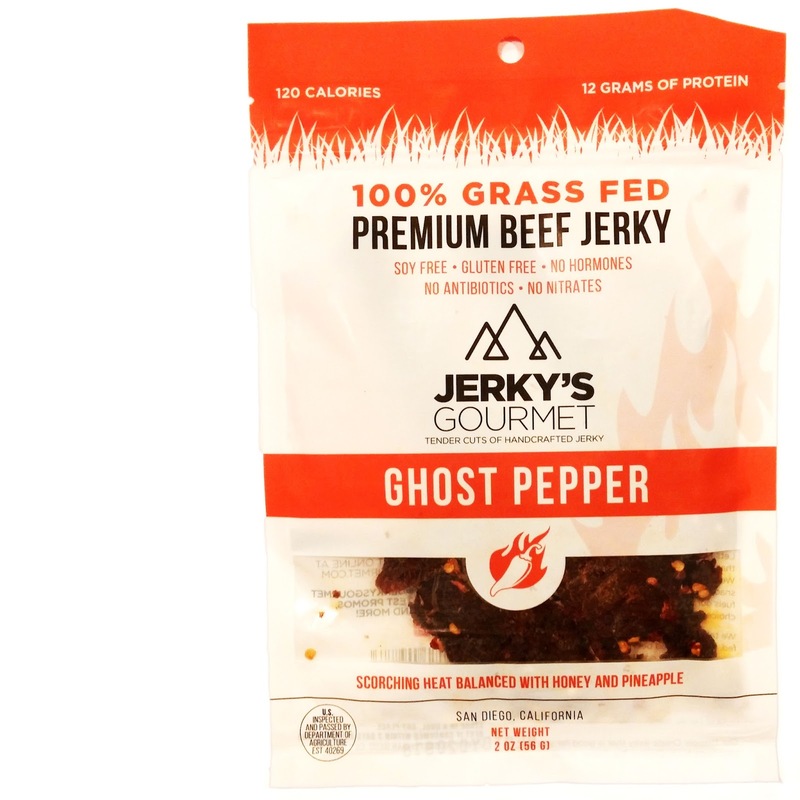 This Ghost Pepper jerky is described as being "soy free" and "gluten free", and is balanced "with subtle hints of honey and pineapple". Grass fed beef, brown sugar, honey, dark molasses, apple cider vinegar, sea salt, lemon juice, worcestershire sauce, granulated garlic, beef stock, pineapple, ginger, ground black pepper, ghost pepper, hickory liquid smoke, cayenne pepper, citric acid, white pepper, paprika. The first thing I taste on the tongue is a strong sweetness. The ghost pepper heat builds up quickly. I can taste some of its flavor as well. The chewing brings on more of the ghost pepper flavor, along with some worcestershire, and seasonings. I can also taste hints of the pineapple. For being marketed as a Ghost Pepper beef jerky, it certainly holds up well. I do get quite a bit of its sharp, seething heat, but also a lot of its fruity, flavor. The heat is quite hot, rating as "hot" on my personal heat scale (level 5 out of 5). It brings on a runny nose and sweaty forehead. The flavors that define and dominate this jerky starts with the strong sweetness, along with a fruity pineapple in the background. But then it's the unique flavor of Ghost Peppers that take over. The saucy combination of worcestershire, seasonings, and even beef stock, become noticeable. Considering this also marketed as "soy free" and "gluten free", the use of worcestershire, beef stock, and other seasonings as an alternative to soy sauce works pretty well. I can taste its influence, and creates a backdrop that lets the Ghost Pepper flavor stand out well. The meat consistency seems pretty good. This is a brisket cut, sliced thin to medium, and has a typical jerky chewiness, though still moist. I don't see any fat on these strips, though light stringiness, which seems expected for a brisket cut. 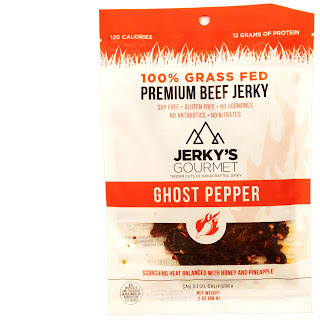 Verdict: This Ghost Pepper variety from Jerky's Gourmet does a great job of giving you the full experience of a Ghost Pepper infused jerky with its sharp, tongue-piercing heat, and its fruity, peppery flavor. But it doesn't stop there, the saucy marinade of worcestershire, beef stock, and seasonings makes for a great alternative to the soy sauce used by so many other brands. The strong sweetness and the light pineapple background creates for a nice contrast to the fiery heat and pungent Ghost Pepper flavor. It's a well balanced jerky that gives you a lot to think about in each bite.